Take control of your engine with our stand alone Programmable Engine Management System. 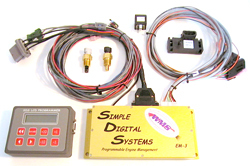 Developed by Western Motorsports and Simple Digital Systems to replace the Ford EEC fuel injection computer, our EFI allows you to program all parameters for fuel and ignition to tune for maximum power from any engine combination. In the past 20 years the WMS / SDS has evolved but Simple remains part of our philosophy. We build the system so the average person can install it and tune their engine. While other laptop systems have fancy graphics and bells and whistles, they also have complex software to understand. The SDS is all about making your engine run better 'cause that's what EFI is all about! Plug and play! 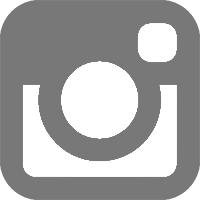 The easiest engine management system to install and program on the market today. Typically in about two hours the system is up and running. Excellent alternative to a mass air conversion with a similar cost. The SDS has far more tune ability and no extra chip or software is required. Supercharger and Turbo compatible up to 30lbs boost. Handles fuel enrichment, timing retard, boost limit, rev limit and more. Optional map sensors available for up to 60lbs boost. No expensive laptop or complex software is required. Our handheld programmer handles full sensor diagnostics and programming in real time with easy to understanding tuning. If you can tune a carb, you can tune an SDS - without getting your hands dirty! Includes datalogging for a Wideband O2 sensor. This feature captures the air/fuel ratio for each RPM and stores it in memory. AFR is then displayed in the programmer as shown, making tuning very easy. If you see that the AFR is too rich or lean in a range then you simply change that rpm fuel value. Optional 8 channel Data logging to laptop now available, scroll down for further details. Lean / Rich knob allows +/- 50% change in pulse width to aid in quick tuning adjustments. Does not require a restrictive mass air flow sensor that must be calibrated to different injector sizes. 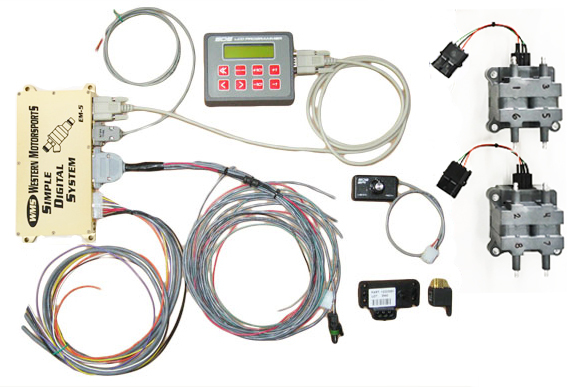 If you change injectors or make changes in the engine, you can program the system to take advantage of the changes through the user friendly SDS programmer. Comes with pre-programmed fuel and timing curves to allow initial start up. Once your engine is running, tuning is easy to complete. Excellent driveability for street, drag or road race engines. System flexibility means your race car can be tamed for street duty. Simple installation for 5.0 & 4.6 EFI engine swaps in early Mustangs, Cobras and Rods. SDS is proven with over 20 years of reliable performance in street cars, race cars, trucks, boats and even airplanes. 1 Year warranty and complete technical support. 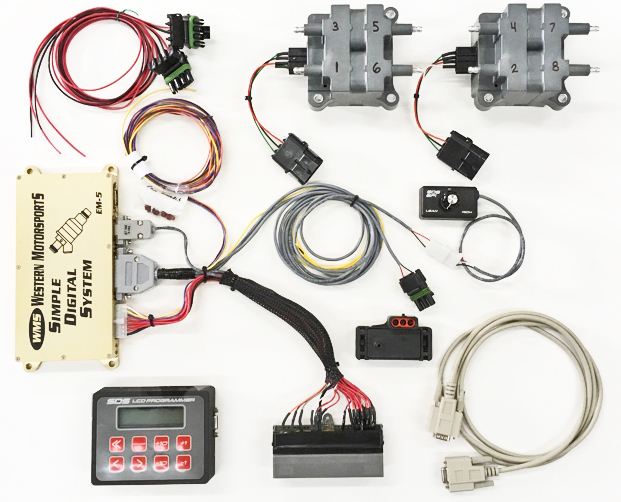 Everything you need to install and program the SDS on a Ford EEC controlled engine is included with the exception of an ignition box. Distributor engines (5.0, 351W, 460, 2.3) use a basic MSD 6A or similar, 4.6 / 5.4 engines use the MSD DIS4 ignition for coil packs or coil on plug. Plug in systems use the factory Ford engine harness, water temperature, air temperature and throttle position sensors. The system uses the Ford TFI distributor trigger and the SDS controls the ignition box. Only the basic ignition box is required as the SDS system controls ignition timing and rev limiter. The SDS will control both factory and aftermarket fuel pumps. The SDS was engineered so that installation can be easily handled by a first time installer. 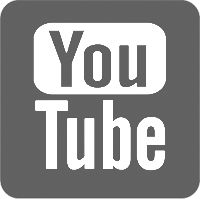 You do not need to be a fuel injection specialist to install or tune our system. Basically the EEC computer is removed and our harness plugs into the EEC port in the Ford engine harness. All the system components are connected with the supplied harness, a wire is connected to the ignition box and that's it - the wiring is complete! Installation typically takes less than two hours. Full Harness System for most Ford V8's with distributor - 5.0 / 289 / 302 / 351W / 351C / 460. Ignition advance under cruise for better mileage and drivability. New to the V25 SDS is optional 8 channel gauge package and data logging. 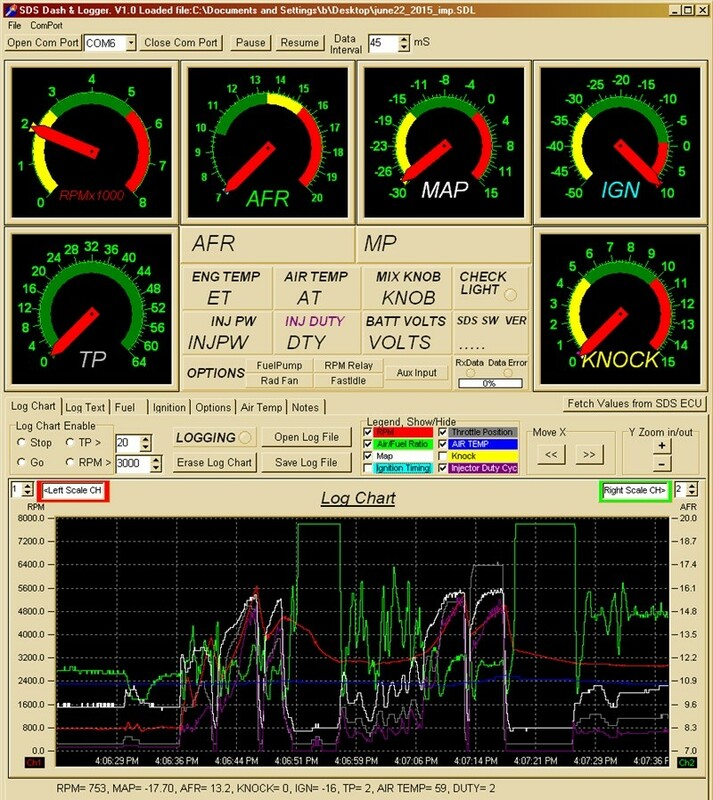 This function allows you to log and store MAP, RPM, ignition timing, IAT, AFR, throttle angle, knock activity and injector duty cycle in text format directly into a laptop. 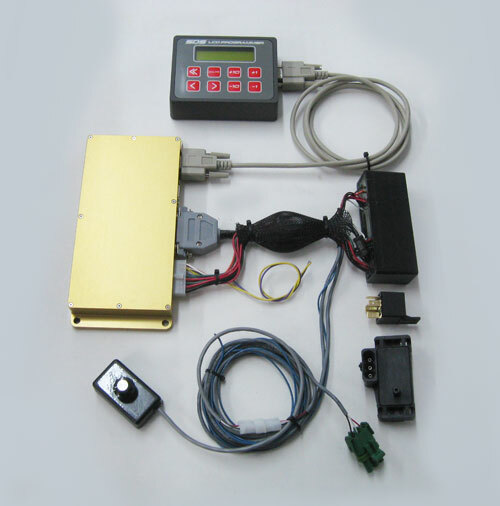 Gauge package displays engine temp, injector pulse width, mixture knob position, and battery voltage in real time. This option also allows you to save and print the values from the ECU. There is no onboard memory, you log directly into a laptop. The software is Windows XP, 7 and 8.1 compatible and we email software once purchased. 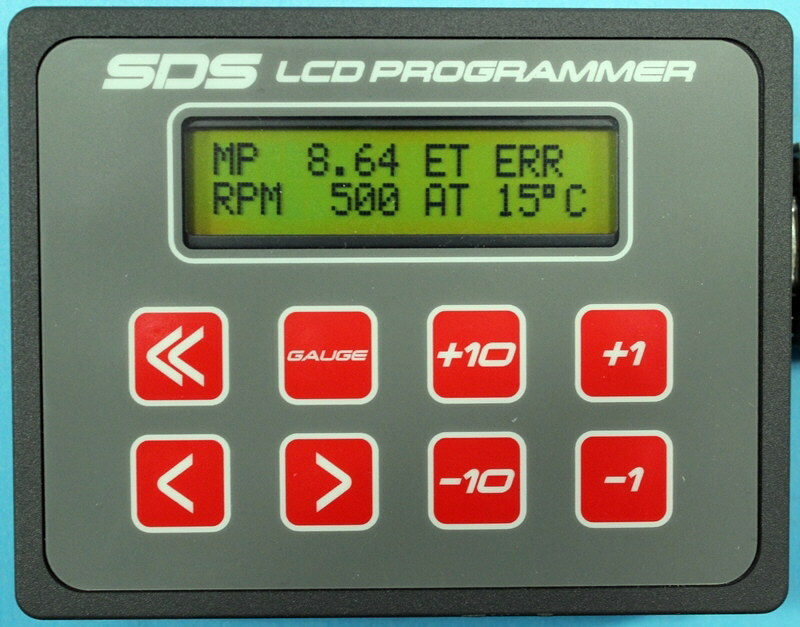 The SDS LCD Programmer is one key feature that makes our system better than other DFI systems. You save hundreds of dollars right off the bat because our system does not require a laptop or its programming software. All programming functions are performed through the handheld programmer shown below. You can select a value you wish to change with the flick of a button and then change that value with another button - done! No confusing menus to fight with, no programs to learn - no other DFI is faster and easier to program than SDS. Once the system is programmed the controller can be removed and no further tuning is necessary until changes are made to the engine. The system automatically compensates for any changes in temperature, air density and altitude. There are 5 separate fuel curves that SDS uses: RPM, Manifold Pressure, Air Temp, Water Temp and Cold Start. Each fuel curve can be fine tuned to your engine combination for maximum power and drivability. To make a change simply select the curve and value you want to change using the <> buttons . Shown above is the RPM curve at 2750 rpm, the fuel value is 83. To add more fuel press +1 to add a little or +10 to add a lot. To lessen the fuel delivery press -1 or -10, its that easy to program! The accelerator pump function is used to provide crisp throttle response when the accelerator pedal is depressed. A fuel value for low and high rpm can be adjusted in the programmer to fine tune the accelerator. Ignition curves can be set at 250 rpm intervals, starting with base timing at idle and working up to maximum advance at higher rpm. Changing the ignition curve is just like changing the fuel curve, select the value you want to change and press the +1 or -1 button. There is also an ignition retard under boost function that will pull back timing the amount you desire for a given amount of boost.